Aston Martin has collaborated with submersibles manufacturer Triton to create a concept for a limited-edition submarine, which it hopes will "redefine luxury for a select few". Codenamed Project Neptune, the submarine was unveiled at this year's Monaco Yacht Show – the yachting industry's biggest event, which takes place every September. The "state-of-the-art" submersible combines the classic design features of Aston Martin's cars with Triton's deep-diving technologies. Although few details and images have been revealed, the companies are billing Project Neptune as a vehicle that will "redefine luxury and performance for a select few". Reports circulating from the Monaco Yacht Show claim that only a dozen of the submarines will be available to purchase each year, and will each cost around $4 million (approximately £3 million). This is more than twice the amount of Aston Martin's One-77 car, which costs around $1.85 million. 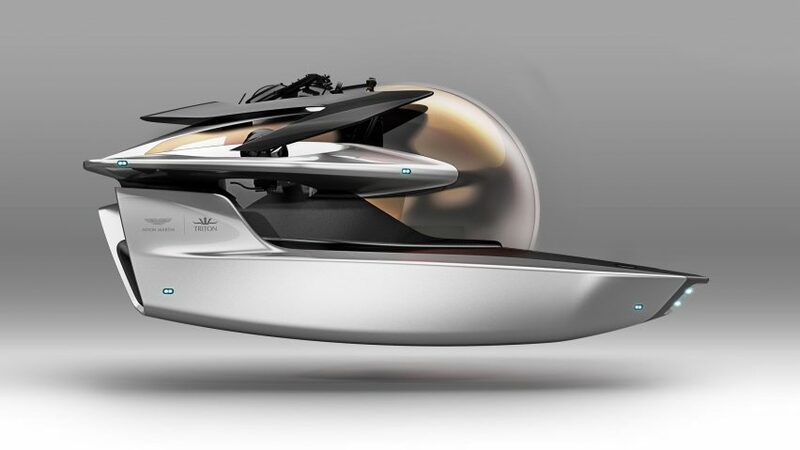 Renders show the futuristic three-person submarine with a bubble-like cabin, encased within a silver and black body – which Aston Martin vice president Marek Reichman likens to the brand's Valkyrie car. "Project Neptune is defined by its sleek, elegant exterior," said Reichman. "We have used forms and proportions that express the same devotion to design, engineering and beauty that shape our cars, such as the Aston Martin Valkyrie hypercar project." Although technical details about the project are currently under wraps, Triton's Super-Yacht Sub could provide clues about how the new submarine may function. Named Triton 1650/3 LP, the submersible can accommodate a pilot and two passengers. It is able to dive down to 1,650 feet (500 metres) and stay there for up to 12 hours, and it can reach speeds of three knots (3.4 miles per hour). "We have always admired Aston Martin," said Triton president Patrick Lahey. "The marque represents a deeply held passion for technology, engineering and timeless, elegant design." "From our first interaction, it was apparent that Triton and Aston Martin were natural partners and our complimentary values will be realised in this truly exciting project." Aston Martin first appeared on the marine scene at the Monaco Yacht Show in 2016, where it released its AM37 powerboat. The firm, founded in 1913, is best known for its high-end sports cars like the Vanquish and Vantage models. It also now offers a service that provides companies with design, engineering and manufacturing consultation. The 2017 Monaco Yacht Show came to a close on 30 September, and saw 125 one-off super-yachts exhibited over a four-day period.